Bright Sparks, our alumni newsletter is published 4 times annually – Winter, Spring, Summer and Autumn – to keep alumni informed of our news and activities. Regular features include news updates from the Fulbright New Zealand office and stories from current grantees both in the US and New Zealand about their work, alumni news and features, and other exciting news. Download issues below, or sign up here to receive new issues electronically. For other inquiries (including later issues, story ideas, physical copy request, or other questions), please email info@fulbright.org.nz. Fulbright Alumni: Did you receive your copy of Bright Sparks? To update your physical mailing address and contact information, email alumni@fulbright.org.nz. We welcome your letters and articles. Any material submitted may be edited for publication. 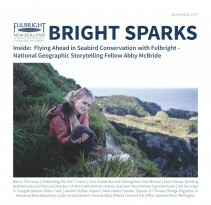 While every effort is made to ensure the accuracy of material in this newsletter, Fulbright New Zealand does not accept liability for any errors or omissions. Opinions expressed are not necessarily those of Fulbright New Zealand.